I was surprised to identify, in the placid strings that conclude the extraordinary film A Quiet Passion, a bit of decomposed Ives: the action dissolves into The Unanswered Question, stripped of trumpet and winds. What is left of The Unanswered Question when the question and increasingly agitated answers are removed? “The Silence of the Druids—who Know, See and Hear Nothing,” in Ives’ words, or, as he also put it, “Undisturbed Solitude.” Musically speaking, a muted string orchestra playing a slowly unfolding progression in G Major. At first I was taken aback that the music would be used without the foreground material that defines it – again, what is The Unanswered Question without the question? And isn’t that the wrong approach to ending a film about Emily Dickinson, whose work is chock full of probing questions? But the music also made sense to me. I never judge fictionalized biographies by how true they are to what actually happened. If I did, I would have to dismiss Shakespeare’s history plays, which would be a pointless loss. It’s not the job of any work of art to reproduce, though reproduction may be a means to an end. A film, a play, a poem has to follow its own logic. 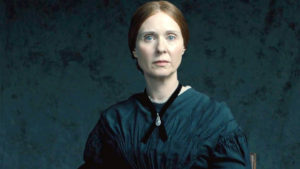 In A Quiet Passion, the main character is caught between her need for approval and her need for the “undisturbed solitude” represented by Ives’ strings. At the end of the film, her questioning is gone, and all that remains is silence – of druids as well as poet. In that sense, the musical conclusion makes perfect sense. The film manages to create a fully realized world of closed-off colors, drawn-out illnesses and pent-up passions. I was entranced by its ability to beautifully explore topics that most films would shy away from: artistic creation, a main character who is often unpleasant, extended death-bed scenes. But it also has some painfully stilted scenes, scenes where something went missing between script and shooting. In that sense, the music that ends the film is awkwardly appropriate: beautiful music with something missing to cap off a beautiful film with something missing. HI. Yes. Thanks for this. I watched last night on DVD at home and was bothered by so many missed opportunities and what seemed like “cheap tricks” & then utterly baffled at the end with music stripped of it’s purpose. I’m not a musician but as a literature teacher and lover of poetry, I felt something missing throughout — and that was confirmed at the end too.